Would you live in a house without windows? I’d guess your answer would be a big no. Can you imagine staying in a boxed home with no air or light or a good view from a window? Well, that wouldn’t be a home at all! That is why it is important to add windows to a house. 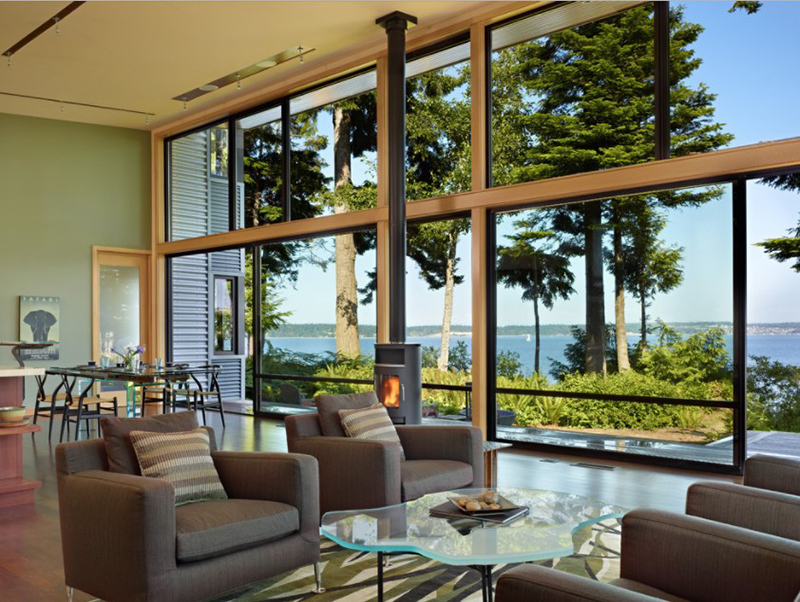 As a matter of fact, some homeowners prefer to have tall glass windows to maximize the view and to have a good amount of natural light into the interior. Yes, floor-to-ceiling windows would indeed be nice for the home, especially in the living room. Can you imagine sitting on your sofa while staring at a beautiful view from your window? That would be very relaxing! Now, this is what you would like to see. What we have today is a roundup of some lovely living room designs that made use of floor-to-ceiling windows. For sure, you would love this and it will inspire you to get a window similar to this for your own home! If this were my weekend house, I know exactly where I would plant myself: in the lounge chair next to the window wall and its stunning view. The narrow widths of glass (the opening could feasibly be one or two pieces of glass) and vertical frames echo the trunks of the trees beyond. Earthy elements such as nubby, textural fabrics and a handmade rug made of wool and silk help blur the line between the contemporary and the natural. Lest you forget your impressive location, a map of San Francisco incorporates the blues of the water and sky. In this case the flowery painting and trees beyond work really well together. Low, winter light comes in through the argon-filled triple-pane low-E glass to further heat up the polished concrete floors, which have their own radiant heating. The sun on the floor reduces the need for the radiant heating, letting the heat dissipate throughout the day. Inspiration for a large modern open concept living room remodel in San Francisco with a ribbon fireplace, travertine floors and a stone fireplace surround. 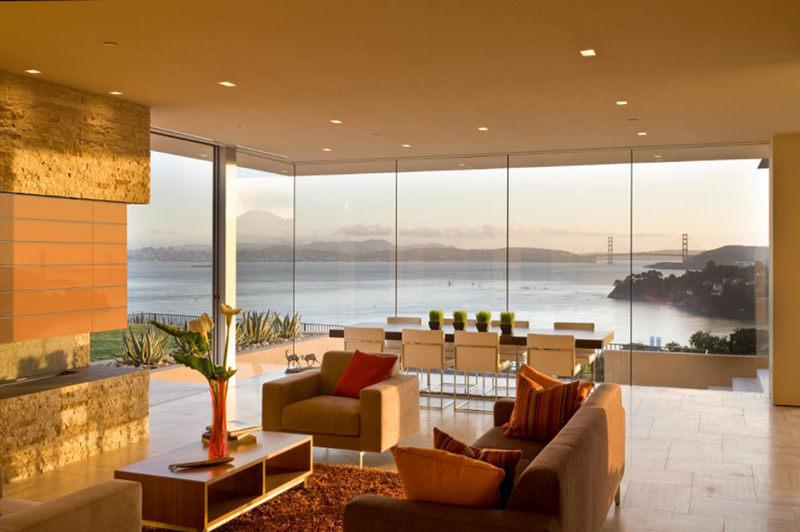 Love the wall of glass and amazing view. Feels so connected with the outside. Through the extensive use of high tech and super efficient glass, both as windows and clerestories, there is no need for artificial light during the day. A family room incorporates the use of different materials for the ceiling, walls and floor including timber paneling and feature lighting. Built in joinery for TV unit and window seat. 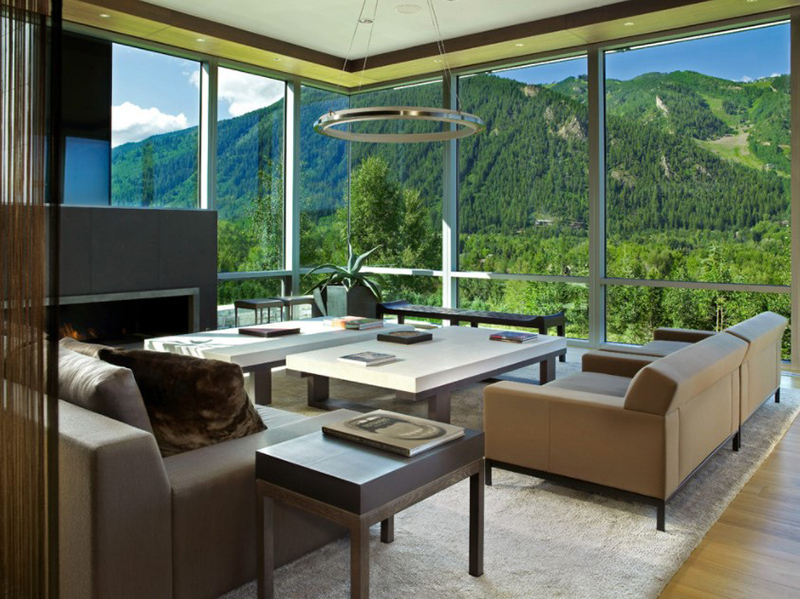 Sixteen-foot ceilings allow for dramatic views from this Aspen, Colorado, living room. 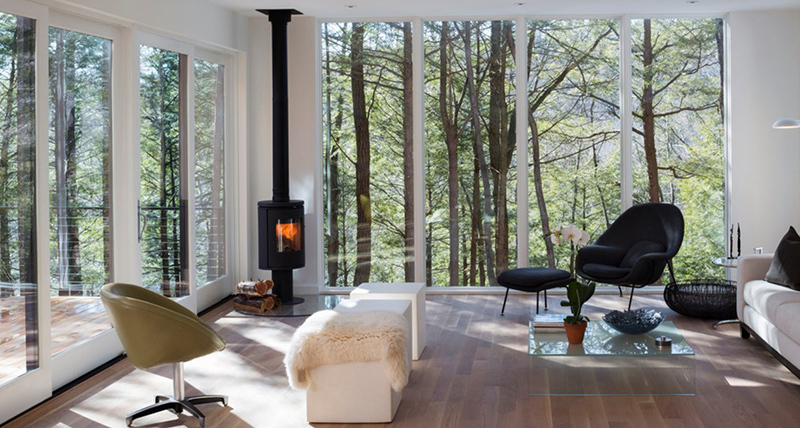 The floor-to-ceiling fireplace provides a good view of the outdoor area. I could spend ages talking about everything there is to learn from remodeling your house: the best types of tile for a shower floor, little details that you shouldn’t overlook when remodeling, tips and tricks for finishing a project on time — you name it. But a remodeling project, being a rather noteworthy life experience, can also teach you a lot about yourself. The house interior has been designed to be completely integral with the exterior. The living pavilion contains more than twelve pieces of custom furniture and lighting. 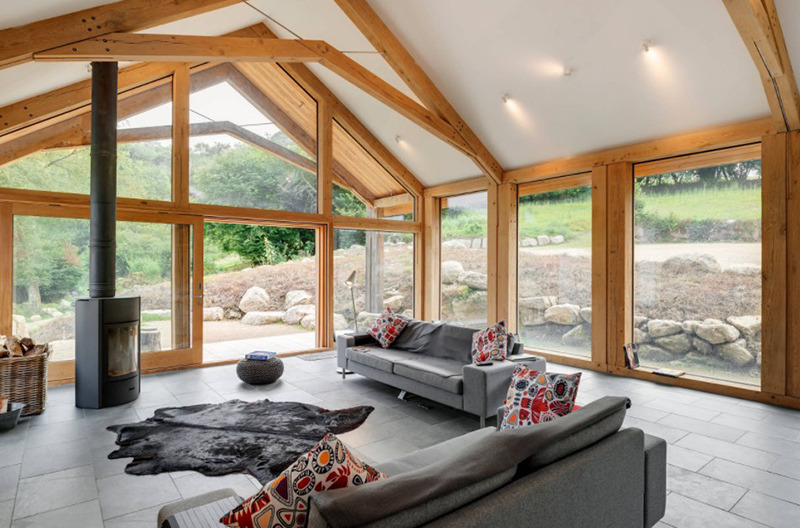 Windows have high-performance LowE insulated glazing and are equipped with concealed shades. The east-facing house is sited along a high bank, with a wonderful view of the water. The main living volume is completely glazed, with 12-ft. high glass walls facing the view and large, 8-ft.x8-ft. sliding glass doors that open to a slightly raised wood deck, creating a seamless indoor-outdoor space. During the warm summer months, the living area feels like a large, open porch. The connection between the interior and exterior was reinforced. Walls of glass rebuilt and re-glazed with dual-pane, energy-efficient doors and windows. 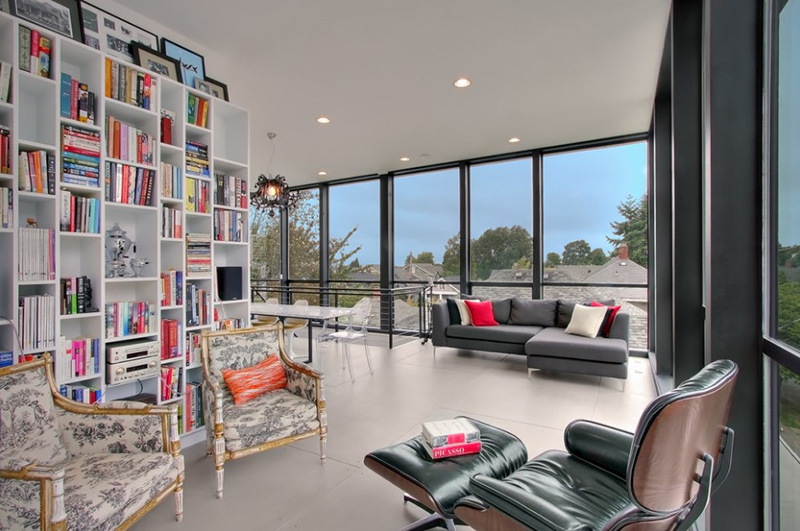 Example of a minimalist open concept living room design in Seattle with white walls and a library. Love the different size openings, in black. The home’s orientation offers both the shade of the oak canopy in the courtyard and the sun flowing into the great room at the house’s rear façades. This modern take on a traditional ranch home offers contemporary materials and landscape to a classic typology. Celebrate the construction – I love the way this room is all about the framework of the building, with a real celebration of the lovely wood and chunky joints. The stove’s flue very discreetly piercing the ceiling in the corner gets top marks from me, too. 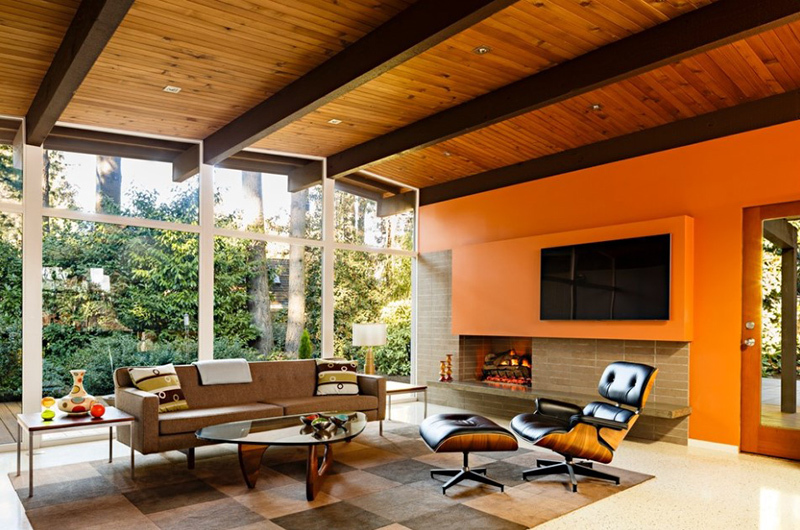 Vibrant and earthy at the same time, orange and brown is a classic midcentury modern color combination. In this room, the bold orange wall helps highlight the dramatic wood ceiling and glass windows, features that are both typical of this era. Brown — even in the form of wood — tones down the vibrancy of orange. 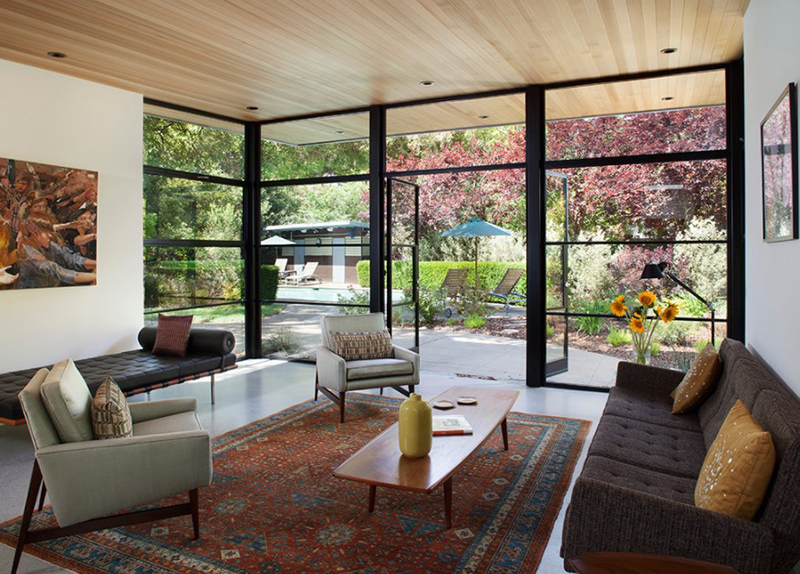 Also, the pairing underscores the warm nature of each color, making this midcentury space stylish and inviting. 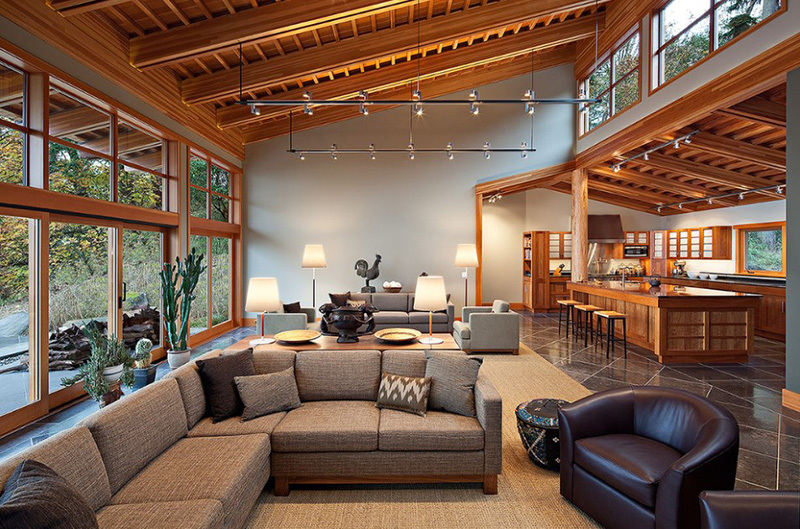 A large trendy open concept living room design in Vancouver with a standard fireplace, white walls, dark hardwood floors, a stone fireplace surround and brown floors. 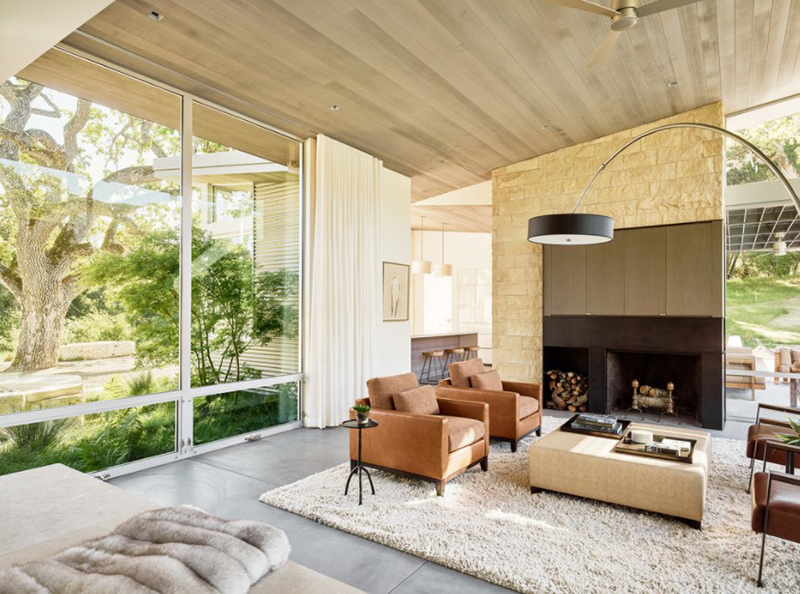 Making the most of a wooded lot and interior courtyard, Braxton Werner and Paul Field of Wernerfield Architects transformed this former 1960s ranch house to an inviting yet unapologetically modern home. Outfitted with Western Window Systems products throughout, the home’s beautiful exterior views are framed with large expanses of glass that let in loads of natural light. 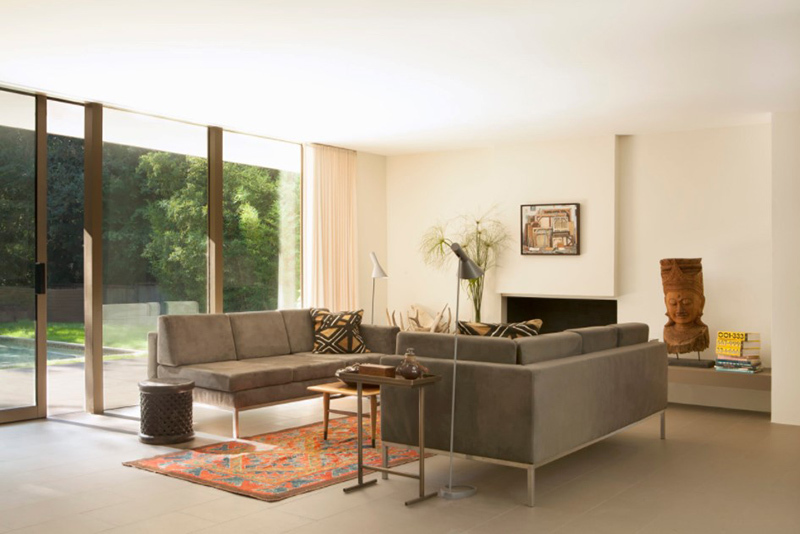 Multi-slide doors in the bedroom and living areas connect the outdoors with the home’s family-friendly interiors. Isn’t it nice to have a living room with tall windows? 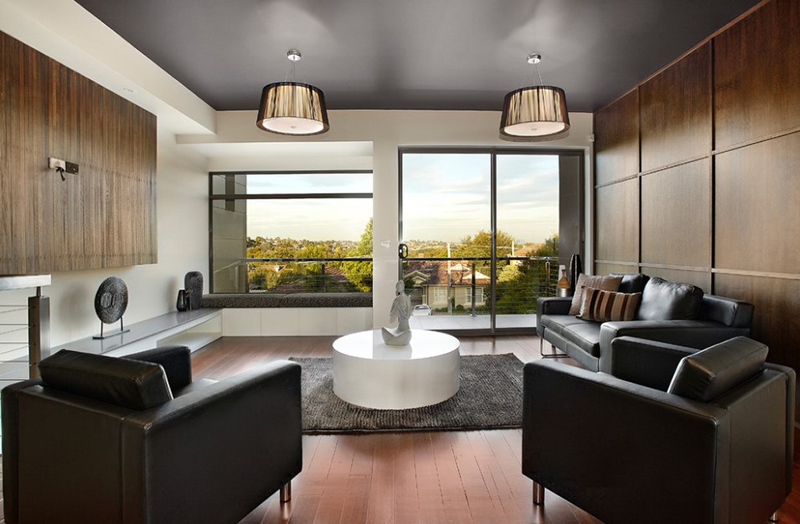 You have seen that it added beauty to the homes and it also allowed the entry of natural light into the interior. Because of this, there is no need to use artificial light during the day. Another positive thing about it is that you will be able to get a good view of the outdoor space. 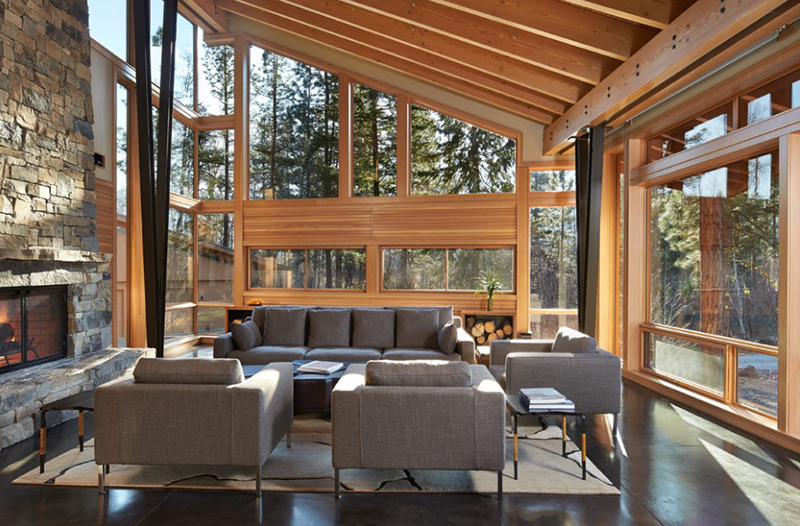 Would you add floor-to-ceiling windows into your living room?